Spanish historian and physician; lived in the fifteenth and sixteenth centuries. His relationship to Judah ibn Verga can not be determined; it is certain, however, that he was not the son of the latter, for he never refers to Judah as his father (see Ibn Verga, Judah). Schudt ("Jüdische Merkwürdigkeiten," i. 131) was apparently misled by the title of the "Shebeṭ Yehudah" when he called its author "Solomon b. Schefet." Ibn Verga himself says ("Shebeṭ Yehudah," § 64) that he was sent by the Spanish communities to collect money for the ransom of the prisoners of Malaga; but he lived also at Lisbon as a Marano, and was an eye-witness of the massacre there (ib. § 60). Later he escaped to Turkey, probably to Adrianople, where he wrote the "Shebeṭ Yehudah," an account of the persecutions of the Jews in different countries and epochs. In a short preface he says that he found an account of some persecutions at the end of a work of Judah ibn Verga, which he copied; to this he added a narration of the persecutions of his own time, the compilation being afterward completed and edited by his son, Joseph ibn Verga. 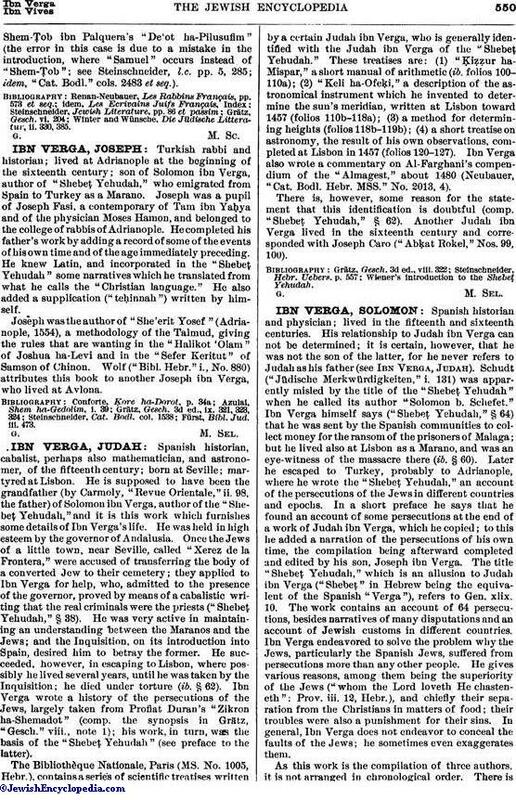 The title "Shebeṭ Yehudah," which is an allusion to Judah ibn Verga ("Shebeṭ" in Hebrew being the equivalent of the Spanish "Verga"), refers to Gen. xlix. 10. The work contains an account of 64 persecutions, besides narratives of many disputations and an account of Jewish customs in different countries. Ibn Verga endeavored to solve the problem why the Jews, particularly the Spanish Jews, suffered from persecutions more than any other people. He gives various reasons, among them being the superiority of the Jews ("whom the Lord loveth He chasteneth": Prov. iii. 12, Hebr. ), and chiefly their separation from the Christians in matters of food; their troubles were also a punishment for their sins. In general, Ibn Verga does not endeavor to conceal the faults of the Jews; he sometimes even exaggerates them. As this work is the compilation of three authors, it is not arranged in chronological order. There isno connection between the narratives, but the Hebrew style is clear and attractive. Ibn Verga knew Latin, and derived many narratives from Latin sources. This work contains also a treatise on the form of the Temple of Solomon. Zunz ("Notes on the Itinerary of Benjamin of Tudela," ed. Asher, ii. 268) points out the importance of the work from the geographical point of view, as it contains a considerable number of names of places, as well as a description of customs. The "Shebeṭ Yehudah" was first printed in Turkey c. 1550; since then it has been reprinted several times. It has been four times translated into Judæo-German, first at Cracow, 1591. It has been translated into Spanish by Meïr de Leon, Amsterdam, 1640; into Latin by Gentius, ib. 1651; into German by M. Wiener, Hanover, 1856. Fragments of it have been translated by Eisenmenger ("Das Entdecte Judenthum," ii. ), Schudt ("Jüdische Merk-würdigkeiten," i. ), Menahem Man ha-Levi ("She'erit Yisrael"), and Zedner ("Auswahl," pp. 96 et seq.). At the end of paragraph 64 Ibn Verga says that he wrote a work entitled "Shebeṭ 'Ebrato," containing persecution narratives and some rabbinical treatises, now lost. 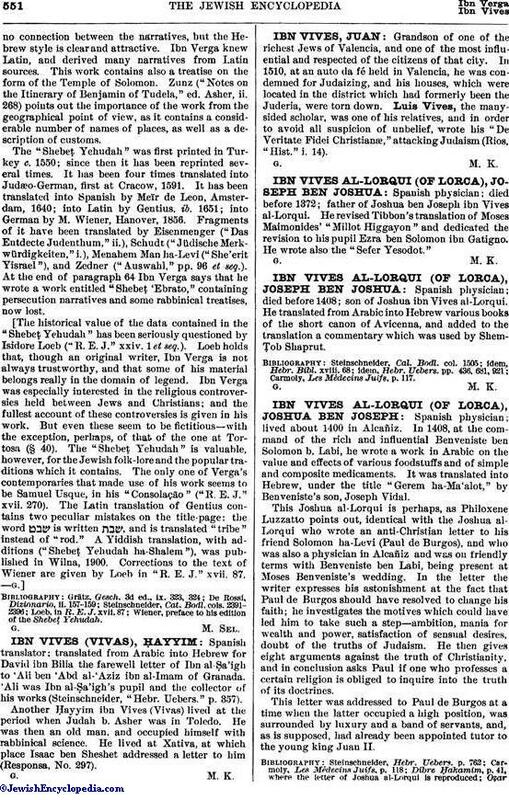 The historical value of the data contained in the "Shebeṭ Yehudah" has been seriously questioned by Isidore Loeb ("R. E. J." xxiv. 1 et seq.). Loeb holds that, though an original writer, Ibn Verga is not always trustworthy, and that some of his material belongs really in the domain of legend. Ibn Verga was especially interested in the religious controversies held between Jews and Christians; and the fullest account of these controversies is given in his work. But even these seem to be fictitious—with the exception, perhaps, of that of the one at Tortosa (§ 40). The "Shebeṭ Yehudah" is valuable, however, for the Jewish folk-lore and the popular traditions which it contains. The only one of Verga's contemporaries that made use of his work seems to be Samuel Usque, in his "Consolação" ("R. E. J." xvii. 270). The Latin translation of Gentius contains two peculiar mistakes on the title-page: the word is written , and is translated "tribe" instead of "rod." A Yiddish translation, with additions ("Shebeṭ Yehudah ha-Shalem"), was published in Wilna, 1900. Corrections to the text of Wiener are given by Loeb in "R. E. J." xvii. 87. Wiener, preface to his edition of the Shebeṭ Yehudah.